At the beginning of the year, I was writing Blindsided, the forthcoming third book in my Men of Steele series (look for it in February! ), while simultaneously creating a new training platform and expanding my Scrivener course materials to include more screenshots, more detail, and videos. I set deadlines for both, happily announcing them to my newsletter recipients, thinking this would force me to meet them. But my deadlines were unrealistic given the scope of each project and the number of significant events/changes going on in my life. I made myself sick trying to stay on schedule for both projects. If I was writing, I felt guilty that I wasn’t working on the class. If I was creating course content, I wanted to be writing. Setting my own hours is the hardest part. I either don’t work enough or I never stop. So, I was struggling until I read a short article that had a huge impact (I’m sorry I don’t remember who wrote it). The gist was this: You will never finish anything—at least not in a timely manner—if you constantly divide your attention. 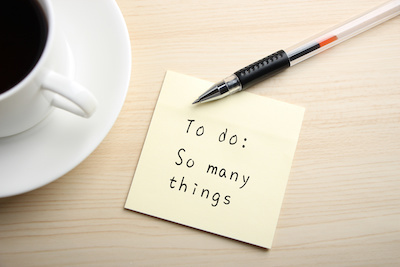 Instead, list your projects in priority order and work on the first one until it’s done. Then move to the second. Repeat. Despite the fact that I knew this approach was more effective—and applied the same “single-tasking” idea to my daily priorities—I had rebelled against it because I didn’t want to stop writing for two months to update my classes. But the reality was that if I didn’t, the courses wouldn’t be done before we moved to California, which meant they probably wouldn’t get done until fall, if at all. And the book probably wouldn’t be done either. So I quit writing (so painful!) and focused on my class platform and lessons. Then I got back to the book. Now I have a new site and a finished manuscript, despite the huge distraction in the middle of my year where I accomplished very little. Moving forward, I’m trying to set my schedule such that I can still work on training and writing, but one always has precedence. The other gets attention when I need a break. Right now, my manuscript is with an editor, so my main focus has shifted to creating a Scrivener for iOS course. Research, craft reading, and fleshing out the next book are secondary activities that I do when I need a break. My plan is to finish the course before it’s time to work on edits. The single-focus concept is simple, but my daily process is a perpetual work in progress, and I have to fight the urge to work on everything at once to feel productive. Occasionally I have to stop and ask myself which is more valuable: Many unfinished projects in various stages of completion, or a single finished project? So, do you struggle to tame your project list? I'd love to see your tips for tackling it. Nice writeup and good ideas, Gwen. Good luck with both your projects. Good advice. I like your idea of working on one thing (project) before moving on to another. This can be helpful not only for writers but whatever one does, including for home and life decisions. I suppose it’s difficult when one has far reaching responsibilities and/or projects, but it does seem to work well for me to retain focus on one project at a time, while being careful to not let other projects interrupt that process. I think a lot of good productivity comes from good planning, too. There are ways to fully complete one project but have a framework (outline or something) in place for any other projects, or upcoming projects. Thanks, Russell! I agree, it works for anything, but in our do-it-all/multi-tasking oriented world, it’s really hard to stay the course. Planning is key too. I have a weekly page I designed for myself to keep track of key items so nothing slips through the cracks. Usually. 😉 Good luck juggling everything! I have written to you in the past with questions regarding Scriverner… Here are two more. I am writing a text book using the basic template. Is there a means by which I can create columns on the page. ….and I seem to have “lost” several files. Is there a means of hiding a binder (even accidently) ?? If so how do I bring these binders back to the surface.??? Good luck with the new book…!!! Hi, Jim. Your best bet for columns would be to use a table. But really, for something layout-specific like that, it’s probably best to compile to Word and apply columns there. You can’t hide Binder because each project only has one, but you may have accidentally moved files into another folder or into a document (where it becomes a subdocument). I’d use Project Search to look for them, and if they show up in the list, select one of the documents, then click the icon in the header to get a menu and choose Reveal in Binder. That will show you where it is in the Binder. From there you can drag or use the Documents–>Move menu to get it where you want it. The other thing you might have done is collapsed some folders so you can’t see their contents. To expand all folders, go to View–>Outline–>Expand All. I feel the same way, Gwen. I put everything else aside and focused strictly on the book. Once I did that, I could see a real difference in my writing and my level of commitment to it. I know I’ll have a ton of other stuff to do once it’s finished (which will be very soon!) but giving it my full attention has made me feel so much better about it, and far less stressed. Yay, Maura! Writing consistently completely changes my relationship with the manuscript and keeps me wanting to write (and having ideas). Good luck getting yours finished!